Chick (Poco Lil Chick Bar) is a 25 year old registered American Quarter Horse. 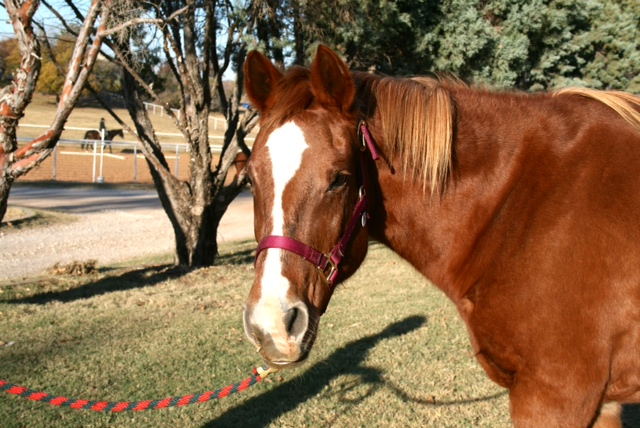 She is a beautiful sorrel horse with a lighter mane and tail. She is easy to tell from the other horses because her mane falls on both sides of her neck, on other horses it falls one way or the other. Chick has been with Rocky Top for 10 years and quickly became one of the best horses we have ever had out here. She is everything we look for in a therapy horse. She is super patient and dependable. She carries anyone, from some of our neediest riders who need tons of support, to our most independent riders who can ride her with just an instructor present. She is loved my many at the ranch and known as the go to horse for any kind of rider. Chicks only flaw is she doesn’t like other horses too close to her rear end, she will kick out if one gets too close. She loves peppermints and any kind of treat and is often brought them by loving riders and their families.